A legal feud between a MetroWest condo owner and his condo owners’ association escalated over the Memorial Day weekend, as armed deputies entered Howard Fox’s home with a judge’s order to seize all of his belongings. 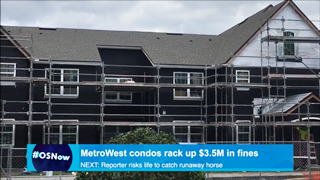 He has sued the condo association several times, mostly regarding a history of construction defects at the complex, called the Hamptons at MetroWest. It’s the largest condo complex in Orlando. The association obtained a judge’s order to confiscate everything in Fox’s condo based on the court awarding the association $104,700 in attorney’s fees. The order itself was sealed. Fox’s attorney, Mark Lippman, said the property seizure was technically legal, but he called it “dirty play” purely designed to get Fox out of the complex. It also costs money to get what is known as a break order, he said, and Fox’s items probably won’t satisfy the judgment if sold at auction. The judgment against Fox had been signed in March. An attorney for the association, Scott Newsom, said the group did what it had to do to enforce the judgment. “Fox had an opportunity to satisfy the judgment or enter into a payment plan and chose not to,” he said. Another attorney for the board, Jim Byrd Jr., said the condo association couldn’t comment on the matter any further because it is part of ongoing litigation. Both sides of the dispute have had plenty of legal trouble for years. Fox pleaded no contest to brandishing a firearm, a felony, during a confrontation with guests in the complex in 2013. The condo association has racked up $3.5 million in code violations for shoddy construction, water damage and other problems. Construction crews are working on repairs. Fox has sued the association over the construction defects, and they sued him, alleging that he displayed “aggressive harassing” behavior routinely in the complex and allegedly disparaged the complex’s board in a blog. Fox signed a settlement in 2015 agreeing not to defame the board anymore. It also restricted his ability to file complaints. Lippman said he thinks the settlement and the break order may have violated Fox’s constitutional rights. “They spent money on this, rather than on fixing their code violations,” the attorney said. A spokeswoman for the Sheriff’s office said they couldn’t provide more detail on its actions since the judge sealed the order. She said the agency does not track break orders.